Offers Ferry Sardinia. Compare & book at best price the ferry to Sardinia. 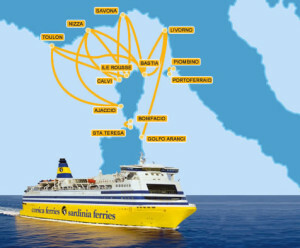 Among the various connections to Sardinia from Italy mainland: Genoa, Leghorn, Piombino, Civitavecchia, Naples, Trapani, Palermo, Marseille, Barcelona and among the ports of arrival in Sardinia there are Olbia, Golfo Aranci, Porto Torres, Santa Teresa di Gallura, Arbatax, Cagliari. The companies that can be booked for the island: Tirrenia, Moby, Sardinia Ferries, Grandi Navi Veloci, Grimaldi, Saremar, SNCM, La Méridionale. It is advisable not to select the ports of arrival and departure for Sardinia but to leave the selection unchanged in order to leave the system the freedom to propose all the routes and then choose the best proposal. Sardinia is located in the middle of the Mediterranean Sea, and it is one of the biggest tourist destination in Italy. Widely known for its white sandy beaches and crystal clear water. It’s an ideal destination for every type of holiday: beach holiday, cultural trip, wine-and-gastronomy tourism, sporting activities.